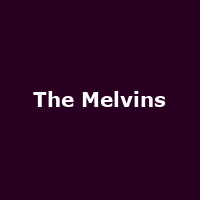 You might not be too familiar with The Melvins - formed in 1983 as a stoner-metal/sludge-metal and every other low-down-'n'-dirty metal genre band you can think of, Buzz Osbourne (the only remaining founder-member left in the band) and trusty long-serving drummer Dale Crover, have powered their way into an admirable situation, almost 30 years later - near-commercial obscurity. Even after a short spell on the mighty Atlantic Records, failed to elevate them to hit-making chart-toppers. So why are they so revered? Apart from being cited as 'The Godfathers of Grunge', The Melvins began their connections with a certain Kurt Cobain and Krist Novoselic in 1988 when Crover played on a few pre-Bleach and pre-Grohl Nirvana demos, for a start, having already pounded his way through a few similar sounding Melvins albums. Original member Matt Lukin, went on to help form Mudhoney, themselves seen as a huge influence on the later Seattle scene, while during those heady ripped-jeans and skanky-haired glory days of "Nevermind", Cobain and co ensured The Melvins had a crack at success with that aforementioned major-label deal. The first resultant album, "Houdini" issued in 1993, is often cited as the band's finest work. One of the tracks on it, "Goin' Blind", is a Gene Simmons original, resulting in the Kiss man joining The Melvins on stage in the US, as you do. In later years they've collaborated with many artists, including the Dead Kennedys' head-honcho and activist, Jello Biafra, issued their recent studio album "The Bride Screamed Murder" and this year saw them perform in New Zealand just as the Christchurch earthquake was kicking off a few feet away. Er, then they experienced the same thing in Tokyo a few weeks later. Talk about lucky [or unlucky, depending on your perspective - Ed]. Hopefully, the only tremors you'll hear when The Melvins play the UK, will be the speakers resonating under the groan of their intense and beautiful racket. First stop is Cardiff on 30th September, followed by a full European jaunt, then back to Britain for shows in November in Birmingham, Leeds, Camden and finally Bristol on the 14th. We have tickets for all dates available now - £15 for all shows [Note: Bristol has already sold out - Ed]!